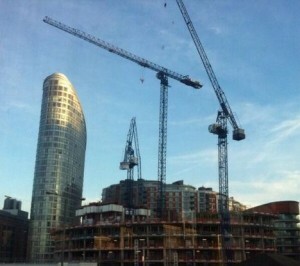 Two tower cranes collided over Canary Wharf in London, UK today seriously injuring a 35 year old man. A flat top Yong Mao saddle jib tower crane was set up over the top of a Jost hydraulic luffing jib crane, and we are told that the jib of the higher crane was low enough to strike the luffer which had its jib in the out of service position. Subsequent reports have confirmed that the injured man, was the operator of the Jost crane, which is owned by LTC (London Tower Crane service). We understand that the man suffered lacerations to his head but is stable. The principle contractor on site is Balfour Beatty which has confirmed that an incident occurred and that a man was injured. The HSE is investigating. Balfour Beatty is exceptionally safety concious, so it seems implausible that the luffing jib would have been set up so that it could reach into the path of another crane’s jib. However our sources on this are highly reliable. The point is that setting up a saddle jib crane over the top of a luffer is never a good idea.